I think in comparison to a family in the states, we use strollers a lot less but when we use them, we use them pretty hard. Since our main form of transportation is our bikes every we don't need the strollers to move kids in the everyday like we might if we were in the States. What we do use strollers for is to go for runs the morning and walks in the evening. Most of our runs are around 2 miles but we've done as long as 6.5. 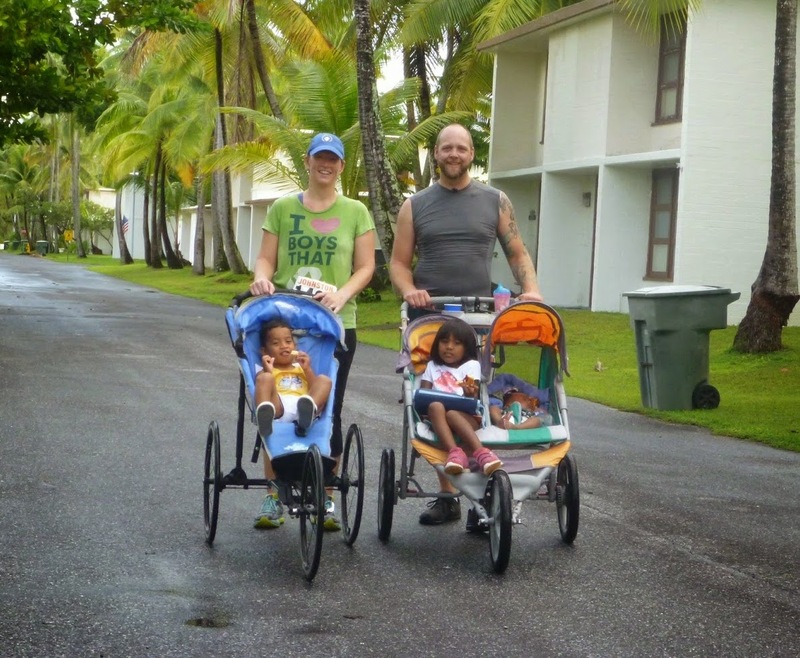 We bought our first running stroller, a BabyJogger 25th Anniversary, from some friends who were PCSing. It was brand new and we were able to buy it for half price because it needed some work done on the wheels.﻿ Normally, BabyJoggers sell for about $400 dollars so we couldn't have afforded it any other way. ﻿ We love it! It's so light and steers really easily. Compared to other joggers we've tried it barely feels like you're pushing anything at all. We've run with a BOB single jogger and this one beats it hands down. The wheels come off easily and it hangs on the back of a door for easy storage. But it is really just a jogging stroller. It has a fixed front wheel, only one sitting posion, and there's no place put a drink or Ipod. It's a fixed wheel jogger that does fine on runs and on walks in the evening. The seats recline, there's storage underneath, and it has cupholders. For the money, this has been a great stroller for us. We've had two problems with it: needing to re-true the front wheel before every run and black mold on the seats. The second problem is probably because we live in the tropics and can't store the stroller inside (it doesn't collapse well). The seats aren't washable and so far, our best solution (carpet cleaner and sun-bleaching) only work so well. The front wheel does have a pretty bad drift. We may have gotten a bad wheel or it could be because the wheel mounts to plastic that flexes but either way, we have to reset the front wheel before every run. If we don't, the stroller makes some pretty drastic veers when we push it. That being said, this stroller has become a work-horse for us. We use it to take the kids to the park, to the movies, and to and from school. They're both comfortable in it and it's holding up to the regular use really well. We used it all over the place on that trip, to get through airports, subway stations, to and from parks, everywhere, and it held up like a champ. It collapsed nice and small and a braided rope added to the handle let me carry it over my shoulder. The handles were a little short for D (at 6ft tall) to push for a long time comfortably but overall, this stroller rocked and we're hoping to get a lot more use out of it on future trips. ﻿ We bought this Eddie Bauer one from someone who was PCSing. We used it as a regular stroller for Sky and then used the baby seat attachment for Fire to take him for walks. Once we bought the InStep Flash though, this one got put out by the curb (literally). It was just too much- too big, too bulky, too much material. I'm happy to report that both the BabyJogger 25th Anniversary Edition jogger and the InStep Flash dualie stroller are still going strong. The only issue we've had with the BabyJogger is that some spokes came loose on a wheel and we had to have it re-trued. On an island where everyone rides bikes, that was a minor and easy fix. It has very little rust or corrosion on it and there haven't been any mold problems with the seat. We still store it inside and only use it for runs. The InStep Flash has gotten a lot of hard use and is starting to show some wear. The picture below is from the Columbus Day run this year and as you can see, we've had to change out the seats (they're green now, not orange). This stroller has always been kept outdoors, although always under a patio, and the seats were starting to show black mold that couldn't be cleaned off and there was also some tearing at the seams. Replacing the seat was easy: a short phone call the manufacturer and then swapping the old one out for the new one when it arrived. The storage basket has also fallen off but it can't be replaced, even if we could purchase a new one, because it was held to the frame with snaps and thos have rusted off. The metal frame is showing rust at the stress points and the seat is collapsing in at the middle just a bit (I think this might have been corrected with a center support bar in later models of the stroller). We'll probably have to buy another dualie jogger in the next year but I think we'll probably be buying the same make and model. While it's a few pounds heavier than the BabyJogger we have now, it's still much lighter than many other single joggers. The Thule version has a reclining seat and comes with a basket underneath, something that had to be purchased seperately on the BabyJogger. 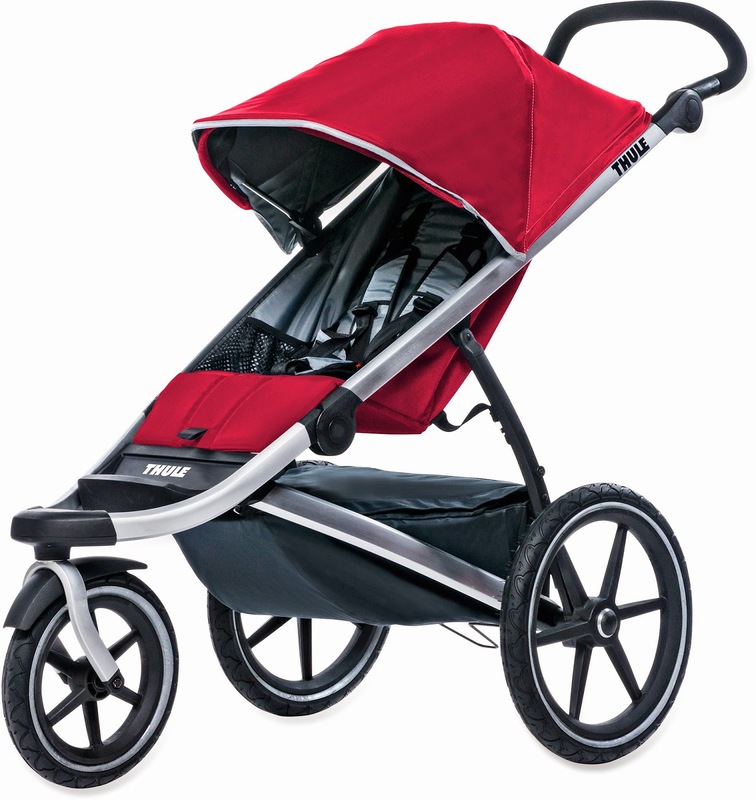 Thule does offer a fixed-wheel, metal-spoked version of this that is more true to the BabyJogger 25th Anniversary edition but those features only cut 1 pound off the weight of the stroller. For me, the benefits of a fixed or swiveling wheel and plastic (rust-resistan) spokes outweigh (!) that difference. Have you tried any of these strollers? What did you think of it? Do you have a favorite jogger?